Purchased the pause screen, animation and audio DLC packs. Found all the hidden DLC packs in the DLC Quest campaign. Collected all the coins in the DLC Quest campaign. You bought everything in the DLC Quest campaign! You Did It! Kind of. You finished the game! Well it ended anyway. Maybe there's more? Finished the game, vanquished evil, and the hero got the girl. Killed all the human NPCs and all the sheep. And for what? An awardment? Geez. I've Got a Ruddy Gun! Found a weapon that in no way unbalances the game. Collected all the coins in Live Freemium or Die. Found all the hidden DLC packs in Live Freemium or Die. You tried to cheat! Isn't that cute? If this game had cheats, they wouldn't be free! Your willingness to sacrifice yourself for the sake of exploration knows no bounds. 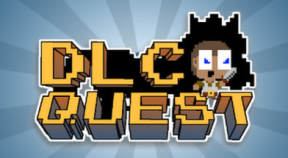 You discovered the story of the mysterious DLC Man. Uh, congrats? I'm Player and this is my favorite awardment in the game. You lived long enough to die a hero and did what had to be done. Given the run around, you still played fetch and helped everyone! Good job! Ended the Comedian's reign of terror. You progressed in the story! Congratulations! Is this really an accomplishment though? Beat the DLC Quest campaign 100%, really fast! Beat Live Freemium or Die 100%, really fast!